Islam Around Us: At least six killed in Kabul suicide attack. 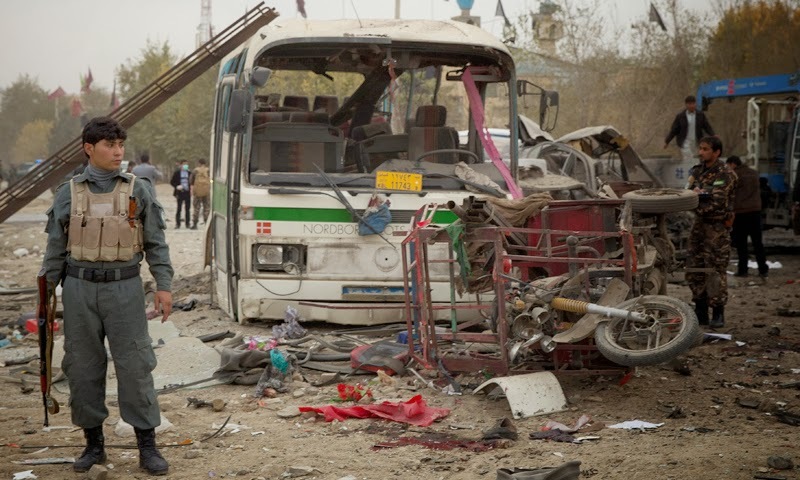 KABUL | 16 Nov 2013 :: A suicide bomber detonated an explosives-packed car in west Kabul, killing at least six people near a compound where Afghan elders will debate a security pact with the US next week, officials said. Another 22 were injured when the vehicle blew up about 150 metres from the giant tent where some 2500 tribal elders and civil leaders will gather on Thursday to decide on the future of US troops in the country after Nato coalition pulls out in 2014. “Initial information shows that unfortunately four civilians, one police and one soldier have been killed in today’s attack. Twenty-two more, the majority of whom are civilians, have been injured,” said spokesman for Afghan interior ministry Sediq Sediqqi, adding that the toll may rise. 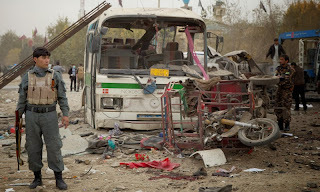 A statement issued by the Afghan interior ministry said that the bomber was being pursued by security forces shortly before the explosion. “The attacker driving a vehicle had been identified and was being pursued by security forces. He detonated himself after police opened fire on his vehicle,” a statement issued by interior ministry said. Earlier in the day, President Hamid Karzai had called on the Taliban and their allies to join the assembly, known as a 'Loya Jirga'. “We invite them, please come to this national jirga of Afghanistan, raise your voice, raise your objection... and share your views,” he told a news conference in Kabul. The draft pact was hammered out in Kabul last month during a visit by US Secretary of State John Kerry. But he left without a final deal as Afghan President Hamid Karzai said only a jirga had the authority to decide the contentious issues. These include a US demand to retain legal jurisdiction over its troops in Afghanistan, which would give them immunity from Afghan law. The request emerged as the main sticking point after Kerry’s visit. The Taliban, whose government was toppled by a US-led invasion in 2001, has rejected the jirga and warned members that they would be punished as “traitors” if they endorsed the deal. Hezb-e-Islami, a Taliban affiliate, has also refused to send members to jirga, calling it “legalising the US occupation”. If the agreement is passed by both loya jirga and parliament, between 5,000 and 10,000 US troops would stay in Afghanistan to help fight militants and train the national army. Washington had been pushing for the agreement to be signed by the end of October to allow the US-led Nato coalition to plan the withdrawal of its 75,000 combat troops by December 2014.